The duo from Sweden enlarges its discography with the fourth long player “Farewell my Happy”. 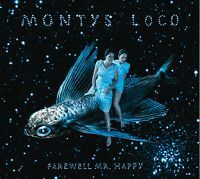 And Montys Loco made a good job of it. That is: more self- contained, diversified and more flowing. The songs sparkle with inspiration and captivates with commendable lyrics. Who is listening to songs like “Criminal”, “Vassal Love” or the sentimental “Ages Ago” will recognize that high class knows no frontiers. By listen thoroughly to the songs, you might notice a certain Pop- attitude. To the listener at home more details will open up which shows the finesse and elaboration the Ladies gave to their work. One single point of critique is the sound which is not as fresh as it was on former albums. Therefore eight and a half deer, the rising trend continues.